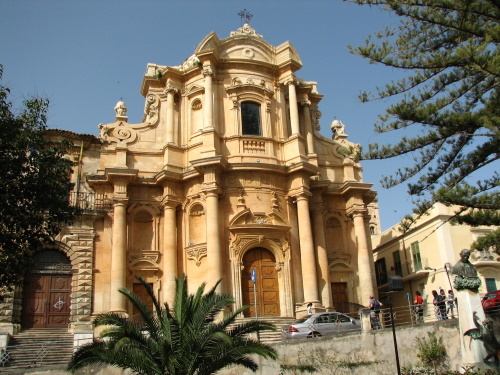 The Late Baroque Towns of the Val di Noto (South-eastern Sicily) are eight towns are examples of 'anti-seismic' urban planning executed in the late Baroque style. The valley owes its place on the World Heritage List to a tragic event in its history. On January the 9th 1693, a major earthquake struck this part of the world. Tenthousands of people died, and cities and towns were (partly) destructed. After this catastrophe, large public projects were started to rebuild the affected cities. The fashionable architectural style of the period was used, Baroque, together with 'anti-seismic' urban planning. 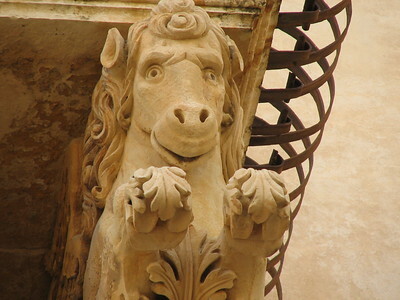 The first days of my stay in Sicily I spent in the town of Noto. Its main street, the Corso Vittorio Emanuele, is lined with wonderful baroque palaces and public buildings: the ideal surroundings for an Italian evening stroll. The San Nicoló Cathedral unfortunately is hidden under scaffoldings at the moment, but there are plenty of other monuments to admire. The Palazzo Nicolaci di Villadorata was the highlight for me: its balconies are ornamented with cherubs, lions and horses, all very fine in detail. A great spot to try out my new camera! Using a rental car, it's very easy to visit some of the other towns around Noto. 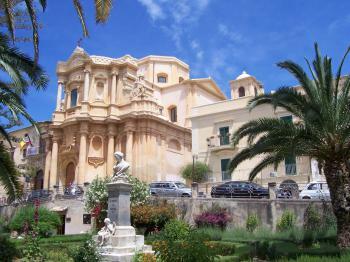 I drove to Modica, Ragusa and Scicli on Easter Monday. 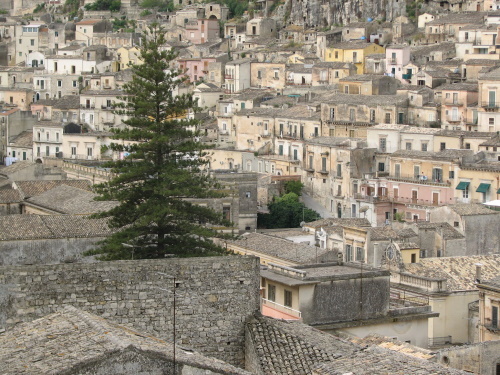 Modica is an elegant town with probably the best baroque church of the valley. There are amazing views. Ragusa is very different: all hills and steps. The main church (Duomo di San Giorgio) currently is also being renovated like the one in Noto. Scicli finally is way off the beaten track, a huge block of houses in the middle of nowhere that looked completely desolate. ICOMOS compares the Val di Noto to Mdina and Valetta on Malta. Also tainted by the same earthquake (though to a lesser degree), the same Arab influences and the elaborate balconies are there. The Valley is a good place to base yourself for a few days, and enjoy the high quality architecture, the relaxed atmosphere and (as always in Italy) the food. I visited this WHS in May 2015. This WHS is made up of a series of quientessential Sicilian baroque towns and cities. The most pretty and popular one of them all is Noto. 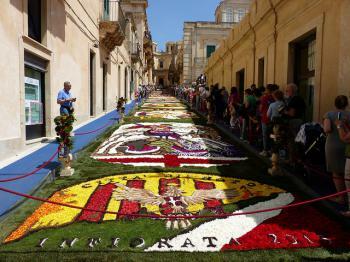 I was lucky to visit during the Infiorata di Noto which takes place every year on third weekend of May. Via Nicolaci which is the street with the most famous baroque balconies is adorned with a huge flower carpet, while other important squares and sites have minor ones. For some odd reason, this year's theme was Catalonia! The best view to be had is from the Bell Tower of the Church of San Carlo. I knew that Noto would be packed during my visit so I decided to visit only after having visited all the other sites mentioned in the WHS inscription to be able to appreciate the Sicilian baroque architecture in a peaceful and quiet environment. Noto is closest to Syracuse and Catania so that makes it well on the beaten path for day trips. My first experience was in Catania which I had already visited when I was younger but I didn't count it as a visit because I feel it does not represent the OUV this WHS indeed has. Once again, I came back with the same feeling and I wouldn't recommend anyone wanting to pick just a few towns out of this series to visit Catania. 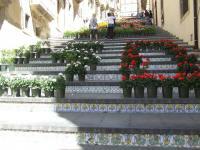 Next I visited Caltagirone which is most famous for its ceramic tiles. Again I was not impressed although I preferred it to Catania. In Ragusa Ibla, I started to understand the authentic OUV of this WHS. The over-the-top baroque details are mostly visible around the main cathedral square. 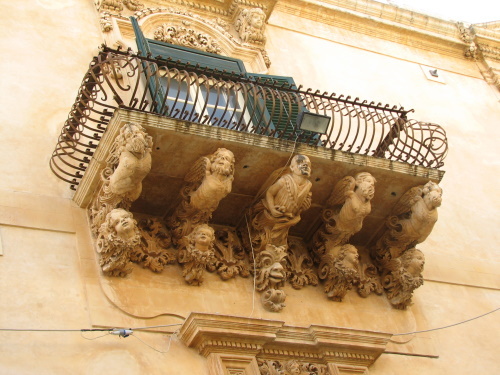 The balcony sculptures are not looked after as are the one of Scicli or Noto but still worth viewing. The famous Italian TV series of Montalbano was shot in this area so many Italians visit these sites for this reason rather than for their WH status. While I was staying in Scicli, I noticed that the filming of one of the latest episodes was taking place. Scicli I must say is my personal favourite out of the sites I visited. It is the most "remote" and it is clearly still home to many many locals and not a "museum town". There is plenty to see and everything has been cleaned up and restored lately so I was really impressed overall. The most imposing and representative church for Sicilian Baroque in my opinion though is the Cathedral of Modica. It's truly magnificent and after I visited I enjoyed a truly homemade icecream from an old local vendor who has been working as an icecream vendor with his vintage van for the past 70 years or so! He showed me old photos of Modica from his childhood and explained the hardships he had to endure during World War II. I really enjoyed visiting this WHS and I wouldn't mind visiting Militello and Palazzolo if I visit Sicily again in the future. Catania - the largest town with many Baroque buildings including 4 churches in via della Crociferi alone plus the church of Sta Agata opposite the duomo and the Palazzo Biscari. I had the opportunity to visit all 8 cities being part of this WHS. Summer is hot in Sicily but one of the outcomes of such high temperatures is that you don't see a lot of people walking around especially during the warmest part of the day. I have good memories for each one of them. I was in Caltagirone during the Luminaria (end of July) and enjoyed the spectacle of lightning the scalinata with candles. I visited Militello in Val di Catania with the chairman of the local ArcheoClub who came to me just because I was taking pictures of one of the many churches that can be seen and wanted to share with me his knowledge of the town history. I combined the visit of Palazzolo Acreide with the old Akrai. I was amazed with the brightness of Scicli. I did find difficult to walk up and down hills in Modica. I couldn't avoid the fish market odours between the Duomo and the Ursino Castle in Catania. I found Noto being like an open museum, nice and clean. But the one I preferred was Ragusa (Ragusa Ibla more than the new Ragusa). Once I started visiting one I couldn't miss the other ones. My wife didn't cope with it and let me finish the tour alone. I spent a morning in the town of Noto, and enjoyed strolling along Corso Vittorio Emanuele, sitting in café’s and taking in the great façade’s. There was still a lot of restoration going on when we visited and there was no access to the Duomo, however the façade was viewable when we first turned up as the hoardings covering it were taken down, and it did look very impressive. As with Els we were very impressed with the Palazzo Nicolaci di Villadorata and its great balconies. The whole of this bloc of the town was had speakers playing soft rock (Michael Bolton) it was not really noticeable when we first turned up but became a little irritating after a while. The street leading up the hill next to the Palazzo was being prepared to host decorative flowerbeds so it would be lovely to see this all in bloom in the summer. I really enjoyed our time here, and the architecture was very impressive and displayed many of the key characteristics of Sicilian Baroque. I had hoped to see a few more of the town however a delayed ferry stopped us from getting to these. I feel that I can claim this as a visited site, mostly based on intent. Noto was a really lovely place to spend a few hours, and the architecture was very impressive, but unfortunately under extensive restoration. Still it was great place to wonder around and fuelled by the excellent coffee and ice cream. 148 Community Members have visited.